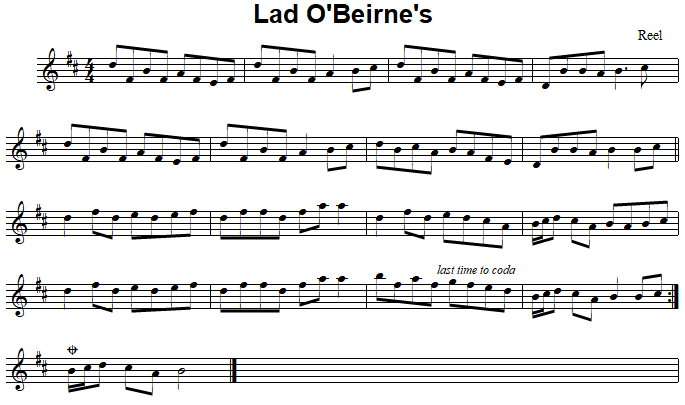 Also known as Lad O'Beirne's Geese in the Bog, this tune is a reel version of that jig, in D rather than C like the jig. the transatlanic nature of Irish Traditional Music. We got this from our friend Judit Stenn. Note: While this sheet music is provided for reference and convenience, I would take it as a personal favour if you would find a local musician to teach it to you or a local session where you could hear it played. This will enable you to learn the phrasing and ornamentation for your instrument which generally is not notated here. The best way to learn Irish traditional music is by ear, by listening to and/or learning from a musician experienced in the genre. At the very least, you will want to memorize the tune so that this page would be superfluous. This version is a version that I played at the time I created this page; it may not be the same as the version I currently play, and it may not be the same as the version with which you are familiar. Go raibh maith agat; Thanks!